Artiss YouTube Embed: The YouTube ID of HJC1AHWEdqs is invalid. Living with Osteogenesis Imperfecta in Panama is difficult, and pay for it is almost impossible. Constant fracture, physiotherapy, pain medications, and repeated long-distance trips to the hospital are just some of the obstacles faced by families affected by OI. Added to the list that most Panamanians who suffer from OI have no health insurance. “Our patients come from extremely poor families”, said Dr.. Jorge Mejia, who heads the treatment of OI in the Hospital del Niño in Panama. "Obviously the economic situation do not have to pay for medicines and other expenses involved with treatment. Someone has to help pay these bills. " Everyone is treated by OI in the Children's Hospital receives some financial support through the efforts of Mejía and Dr.. Renan Arauz, attending physician other OI. “”It is better for patients that treatment is centralized in Panama City, so that we can pay more attention to each case”, Arauz said. "They say there are about 60 cases, but I think there are more. We have to keep looking for cases. There are a lot of people who suffer from this disease and are never acknowledge. We find them and help them. " The doctors would treat all 57 OI cases in the Children's Hospital so they can ensure that they are being treated as they should. Sometimes they can not treat all cases due to problems with the public health system. Some patients with OI, public health insurance to receive care in public hospitals. Mejia said that it would centralize the ideal treatment for children with OI at Children's Hospital. "Patients who have insurance are treated within the public health system”, Mejia said. “(People with insurance) are treated in public hospitals. The rest come here. " The current protocol is the treatment of fractures, physical therapy and pain medication, in some cases. The Children's Hospital waiting for the legalization of a drug treatment key called pamidronate OI. They face a great challenge to make this cost-effective treatment. “Treatment, evidently, will cost some”, Mejia said. "It is the most expensive medicine, but everything that revolves around giving the medication and get labs done, human resources and infrastructure. " At this point, Crystal Children Foundation and the physicians who treat OI just want the drug to be legalized Who will pay and how to pay the medicine is something they have not thought much. The foundation has been able to get some international drug donations, but without the health record, can not be administered to patients. "We hope the government, through the Ministry of Health, give us some support ", Mejia said. "Hopefully we can find some kind of international donations to fund – or at least reduce – treatment costs. " In the end, patients only pay a minimal fee, and Mejia said that poor patients who can not afford to receive treatment as. The foundation also will help fund the drug for patients, but monetary donations are needed. "Here at the foundation, we can only offer very little,"Said Dayana Castillo, Foundation director Crystal Children. "A bag of food, school supplies they need, and guidance for parents when their children know what to do to fracture. That's all I can offer from the foundation at this time. " Even with the shortage of funds the Foundation has filled the gaps in the treatment of OI. "Dayana has changed the perception within the medical community, especially in orthopedics, which deal with the disease”, Arauz said. "With your help, people we met with Ministry of Health and the Hospital to discuss the lack of medicines. We may 12 years behind the rest of the world, but the good part is that people involved in this movement are those who have the ability to make a difference. " 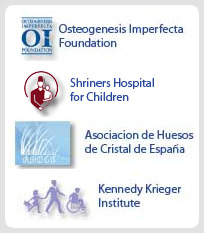 Fortunately, through the dedication of these physicians and through the foundation, OI patients are receiving any treatment, no matter what the cost. OI deal makers are focusing on patient care rather than what it costs. “What I seek with this foundation is that all children with OI can get a better quality of life”, Dayana said. "Whether through treatment, surgery or rehabilitation in order to be happy, forget the pain and be able to lead a normal life. I also want the government to take this into account and help us succeed. "